Mary Annslee Urban grew up watching old-time romance movies, which she attributes to her passion for sweet romance, true love and happy endings. A daydreamer at heart, Mary began her writing journey when the youngest of her five children started school. For several years she worked as a freelance writer for newspapers in her community and has written for magazines and online publications. Raised in the foothills of Arizona, she survived temperature shock when she moved to Western Pennsylvania, before setting in North Carolina with her husband and children. 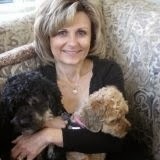 Aside from writing, Mary works part-time as a Registered Nurse in the Behavioral Health field. She is a member of ACFW, and has served as co-president and vice-president of Carolina Christian Writers. She won second place in the Books of Hope contest and has three published novels, Tapestry of Trust, She Came to See the Snow~A Colorado Christmas Romance, and Smoky Mountain Investigation, Harlequin Love Inspired which will be released the summer of 2014. When she isn’t writing, Mary enjoys cooking, traveling to faraway places, playing with grandbabies and all things chocolate. Learn more about Mary and her books HERE. Preheat oven to 350 degrees F. Lightly grease two 9x5 inch loaf pans. In a large bowl, cream together margarine, sugar and eggs. Stir in bananas and vanilla. Sift in flour, baking soda and cocoa; mix well. Blend in sour cream and chocolate chips. Pour batter into prepared pans. Bake in preheated oven for 60 minutes, or until a toothpick inserted into center of a loaf comes out clean. May also make into muffins.